Would you like to enrich your life by tapping into the magical properties of the plant life that surrounds us all? If you answered yes, you’re in the right place. Thanks to the increasing popularity of Wicca, there has been a resurgence in interest in herb magic. With all of the readily available herbs – either store bought, grown, or foraged – herbal magic is one of the most accessible forms of magic of all, not to mention one of the most effective! If you’re looking to start practicing Wicca or Witchcraft (or you want to practice spellwork under a completely different umbrella! ), herbal magic is one of the best starting points. Going right back to the earliest recorded history, the healers, shamans, and other medicine men and women of the “old days” understood that herbs are useful for more than just nutrition and physical cures. But throughout history and across continents, all societies had working relationships with herbs and their magical properties. When you think about it, it’s little surprise that herbs are among the most powerful tools of magic. After all, plants embody the power of the four classical elements working together to create and sustain life – Earth (the soil), Fire (the Sun), Air (Oxygen), and Water (well, plants do need water!). Of course, not all herbs have the same magical properties. Some herbs, like lavender and cinnamon, are primarily used for matters of the heart. Others, including basil and sage, are called upon for protection spells. Throughout this book, you’ll learn about the magical properties of some of the most popular herbs, enabling you to use them effectively during spellwork. Many people are drawn towards Wicca through the concept of Witchcraft and magic, and the idea that we can positively change our circumstances. 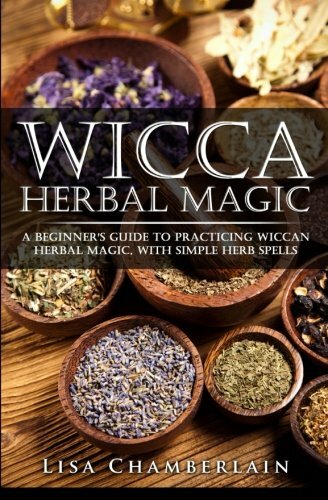 Wicca Herbal Magic was created to teach these people the whys and hows of herbal magic so that they can improve their lives in all the important areas – love, health, and wealth. By reading this book, you will learn about the history of our relationship with herbs and plant life, dating back to the earliest civilizations. You will discover 13 of the most popular (and readily available) herbs used by Witches today, plus each herb’s magical properties and magical associations. You will then be taught several practical tips for working with herbs. This includes how to buy, grow, or forage magical herbs; how to store them; and how to charge them for magical use. Finally, you will enjoy a selection of practical magic spells. This includes a variety of magical teas, magical baths, and magical creations. We will also combine herbal magic with another powerful type of magic – candle magic. In other words, Wicca Herbal Magic will teach you everything you need to know to start practicing candle magic, today! Download now by scrolling to the top of the page and selecting the buy button. Readers will also be treated to an exclusive free gift!